"Most doctors will tell you three to 10 years, but nobody really knows." In 1978, Patricia Mishler left her home in England and moved to the United States after marrying an American. The mother of two daughters—Suzanne, 13, and Janette, 11—her family first lived in Indiana before eventually resettling in Nashville, Tennessee. A grandmother to more than a dozen grandchildren, Patricia once spent much of her free time pursuing favorite hobbies like gardening, sewing, and cooking. But since her diagnosis in October 2014, she has been unable to enjoy them any longer. 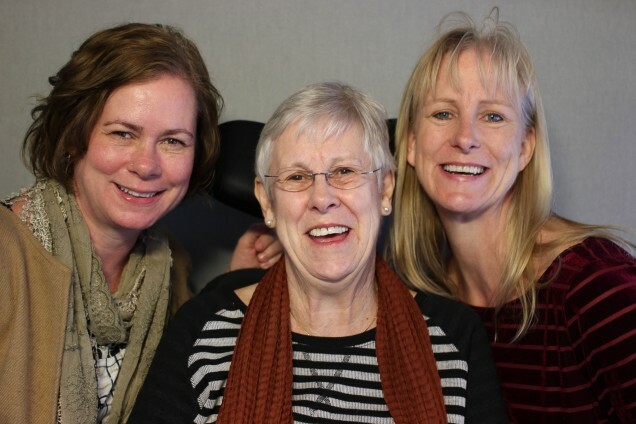 Suzanne (above left) and Janette (above right) recently brought their mother to StoryCorps to talk to her about what it’s been like for her to live with ALS, and also her thoughts on knowing that the disease will one day take her life. Originally aired May 6, 2016, on NPR’s Morning Edition. Top Photo: Suzanne, Patricia, and Janette (left to right) in England on holiday in 1976 courtesy of Janette Lynch. SL: So mom, how do you understand ALS? What is that illness? PM: Well the first thing about it is it’s terminal. Most doctors will tell you three to 10 years but nobody really knows. And so, it’s a mourning process. You mourn the things you can no longer do. Mostly, I like to do things with my hands and this disease took my hands first. So something like gardening, I can’t do that anymore. And that is the most frustrating thing–you lose the ability to do the things you love best. JL: Do you look at your life differently now than before you were diagnosed? PM: Oh, most definitely. You see yourself decline–I can hardly feed myself–and the things you thought were so important, (laughs) not as important as you thought they were. I mean, having you two was probably the most important thing I did in my life. I was so proud of having a child and then I was fortunate to have two. I’m glad to see the young ladies that you’ve developed into. JL: I never knew fear because you always told me, “You want that, go do it.” There’s no way I would have accomplished a fraction of what I did in my life without you. SL: And I don’t think I could have got through my first year of motherhood without you (laughs.) You know, I was doing it by myself so it was nice to know that I had your support. JL: Are you afraid to die? SL: How do you want to be remembered mom? PM: That I love my family and that I am just so proud, just so proud of that.